The idea of the interior comes from the analogy to informal spaces for social gatherings in Poland. During communism and early post-communism years due to lack of a decent public space for outdoor communal activities - especially in residential areas - inhabitants started to use carpet hangers for beating (so-called ‚trzepaki’) as multifunctional get-together points. Trzepak used to imply social gatherings, gymnastics, relaxation, dating and many more. This typically Polish phenomenon became an inspiration for the concept store Salamon Art & Design, which is a sort of a playground for Polish design, art, culture and meeting spot for the local community in Amsterdam. Trzepak was spontaneously reinvented by its users and became multifunctional urban furniture. Store since the beginning was intended to be a gallery, a shop, a workshop, a party place and many more, therefore interior has to be adjustable and suitable for all these different functions. 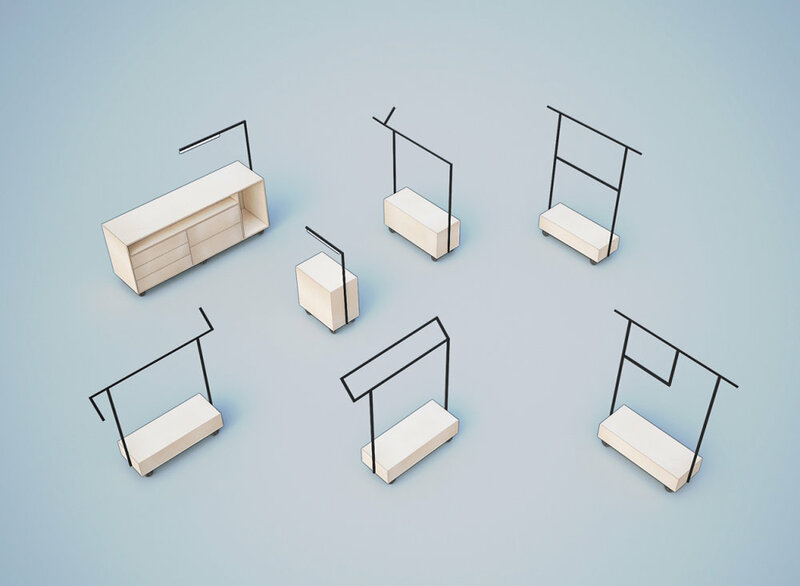 Following the phenomenon of trzepak, elements of interior contain many planned and spontaneously invented functions - they are movable and work as an exposition+storage devices, but they can easily become a chair, a hanger, maybe even a dancer. Each device is different in appearance yet playfully similar to the trzepak.